Magnification lenses: 10x or 20x or 25x or 50x or 100x. Vertical Movement: 150mm or 200mm. Machine weight : 175 Kgs approx. Dimension: L 850mm, W 550mm, H 1350mm Approx. We offer wide range of Vertical Slant Screen Machines, which is manufactured using advanced technical machines. These Vertical Slant Screen profile projectors are made up with fine grade materials, such that it will long lasting and durable. 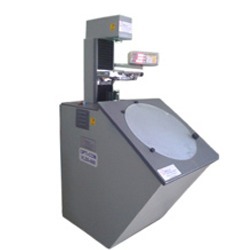 We manufacture and supply these profile projectors to various places at competitive price. Looking for Vertical Optical Comparators ?